So…As expected, it looks like the end (of the Active E lease and Field Trial) is nigh! I called and spoke to the “specialist” to see what the terms of the lease bridging is and found it to be lacking. I asked to find out when the i3 will be released and was given no information as they purported not to have any information. On an unrelated note, I have been told by a salesperson a month ago that they expect it on March 18. I would be surprised if that was accurate within a week either direction. 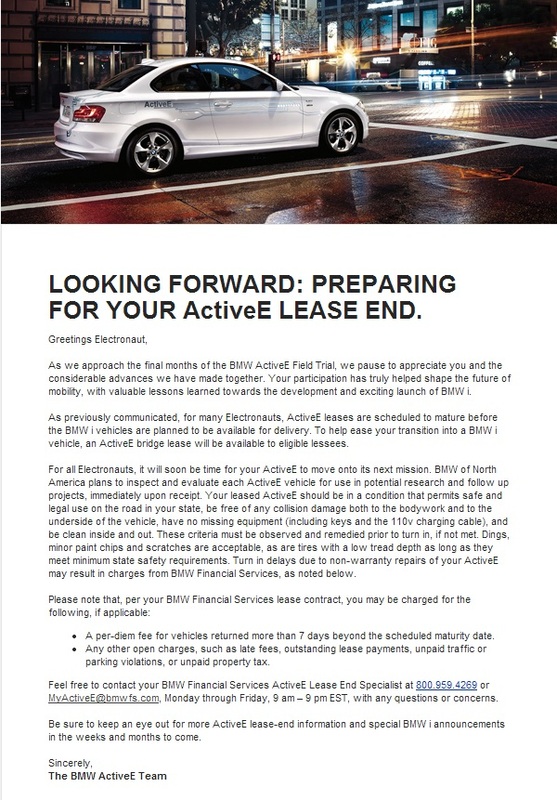 Anyway, it’s nice to get the correspondence from BMW, even though it really is a little late and lacking any sort of incentives to go to the i3, I’m unsure of what I will be doing on that front. We are enjoying the Roadster and the mileage that we’ve been driving the Active E continues to decline. Having never leased prior to this program, I wonder what would be acceptable wear and tear and what would not be. Next Next post: DIWHFOC… Or… Welcome our Roadster to Telematics enabled EV driving.